This coming July 5 is LGBTSTEM Day, an international day celebrating lesbian, gay, bisexual, transgender, queer, intersex, and asexual (LGBTQIA) people in science, technology, engineering, and mathematics (STEM). Science centers and museums that would like to plan events for the day, work with LGBTQIA organizations in their communities, or introduce inclusive practices in their institutions can find resources and information on the LGBTSTEM Day website and in some recorded webinar discussions from the ASTC Advocates for Diversity Community of Practice (CoP). Inspired by LGBTSTEM Day and the 500 Queer Scientists visibility campaign, ASTC’s Advocates for Diversity Community of Practice hosted two webinars on how science institutions around the ASTC network have worked to make their spaces more inclusive, and how they have engaged with the LGBTQIA community in STEM. Summarized below, both LGBT+ STEM Webinar #1 and Webinar #2 included conversations from professionals in the STEM field that have been working to make their institutions more inclusive for LGBTQIA people, including many resources and ideas that can be used by institutions and/or individual professionals. To watch and learn more about what each person discussed in the webinars, click on the link at the end of each description and use the time stamp given to jump straight to the person and their institution. The Museum of Life and Science began a pronoun initiative with the introduction of its new strategic plan, which highlighted the goal to strengthen diversity and inclusion within its programs, audience, and staff. As part of this initiative a task force was formed, which enabled staff members to research and push for more inclusive pronoun usage in email signatures. Emily Lozen details the process the museum used for its pronoun initiative, including the steps staff members took to understand what they knew, what they had already done, and where they are now. To learn more about what the Museum of Life and Science has done to implement its pronoun initiative watch LGBT+ STEM Webinar #2 at time stamp (47:42–59:03). In 2014, the Denver Museum of Nature & Science began a call to staff to find groups of people who could be better served by the museum. The LGBTQIA staff affinity group (called “LGBT-rexes and Ally-sauruses”) answered the call, detailing a need they saw and illustrating how the museum could engage with LGBTQIA families. Eric Godoy explains the system in which the museum worked with LGBTQIA community groups, surveyed focus groups, and implemented staff trainings in preparation for its first LGBTQIA Family Day. To learn more in depth about how the Denver Museum of Nature & Science started its LGBTQIA Family Day, and how the staff expanded its reach in the LGBTQIA community of Denver, watch the LGBT+ STEM Webinar #1 at time stamp (22:29–37:04). Science World British Columbia has been working to make the institution welcoming and inclusive to the LGBTQ2S+ (Lesbian, Gay, Bisexual, Transgender, Queer, Two Spirit) community in a variety of ways. The institution renewed and updated its Body Works gallery to reflect a broader diversity of people’s age, race, gender, and sexuality. Friderike Moon also describes the science center’s involvement in Vancouver Pride events, the July 5 LGBTSTEM Day, and the steps team members are taking to include people of color in the discussion of LGBTQ2S+ STEM. To learn more about what Science World British Columbia has done, watch LGBT+ STEM Webinar #2 at time stamp (26:48–47:41). Pride in STEM, one of the original creators behind the international July 5 LGBTSTEM Day, works to showcase the visibility of LGBTQIA people in STEM. Alfredo Carpineti discusses Pride in STEM’s use of social media in creating awareness about LGBTQIA people in STEM and in promoting the work and resources done by LGBTQIA people in the profession. In addition to these strategies, Carpineti details “Out Thinkers,” which are events that showcase LGBTQIA researchers by providing them with a platform to talk about their work. To learn more about the resources Pride in STEM offers and to learn more about LGBTSTEM Day watch LGBT+ STEM Webinar #1 at time stamp (5:30–22:29). 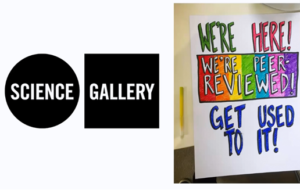 In LGBT+ STEM Webinar 2, Shaun O’ Boyle describes the various organizations and events, such as Science Gallery and the March for Science in Ireland, that he has be a part of in his professional career. He provides a narrative of organizations that have been involved in raising awareness and highlighting the LGBTQIA STEM community. To learn more about organizations such as House of STEM and Pride in STEM, as well as O’Boyle’s involvement in LGBTSTEM Day and the other resources discussed in his talk, watch LGBT+ STEM Webinar #2 at time stamp (4:15–26:48). In May of 2016, the LGBTQ Alliance of the American Alliance of Museum’s released the LGBTQ Welcoming Guidelines. These Welcoming Guidelines were created based off the Core Standards of AAM, and breakdown how the guidelines apply to AAM’s Standards of Excellence and Functional Areas. In LGBT+ STEM Webinar #1, Denniberg explains the development of the Welcoming Guidelines, detailing the process of creation and sharing how people can use the documents in their institutions. To learn more about the Welcoming Guidelines and to hear more about the AAM LGBTQ Alliance, watch LGBT+ STEM Webinar #1 at time stamp (37:05–48:50). In addition to all the ideas and information presenters shared in the two LGBT+ STEM webinars, here are some additional resources and websites related to LGBTQIA inclusion in science centers, museums, and other community institutions. Gender Transition and Transgender Inclusion in the Museum Workplace: A Toolkit for Trans Individuals, Institutions, and Coworkers: Released in March 2019, and briefly discussed by Blair Denniberg, the toolkit is a three-document resource that is intended to support individuals, co-workers, and institutions with transgender inclusion. 500 Queer Scientists: A visibility campaign for LGBTQIA people who work in the STEM field. Resources and a social media toolkit can be found on their website that detail facts, references, organizations, and relevant readings. Pride in STEM: Resources can be found at Pride in STEM’s website, which gives useful links, op-eds, and educational resources. 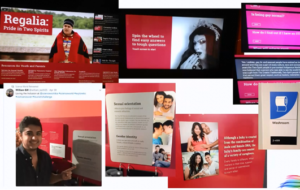 Exploratorium’s “It Gets Better”: Example of how San Francisco’s Exploratorium partnered with the Trevor Project to reach out to LGBTQIA youth. ASTC’s Advocates for Diversity Community of Practice: An online community where participants can join conversations, ask questions, and be a part of a peer exchange on diversity and inclusion. In 2018, ASTC was proud to join a coalition led by Pride in STEM, House of STEM, InterEngineering, and Out in STEM, which created the first International LGBTSTEM Day on July 5. LGBTSTEM Day celebrates the achievements, while highlighting the challenges, of LGBTQIA people in the field of STEM. 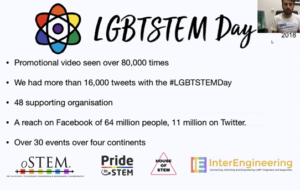 To learn more about LGBTSTEM Day or to learn how to get involved visit https://prideinstem.org/lgbtstemday/ where you can find a press release, briefing documents, LGBTSTEM Day toolkit, and more. Gaby Wilson is an intern at ASTC.